Met 4 kanalen, tot 500 MHz bandbreedte en 5GS/s real–time sampling,is de PicoScope 6000 serie de ultieme USB oscilloscoop. Een enorme stap in PC–based test apparatuur, de PicoScope 6000 series biedt een wereldwijde toppresterende oscilloscoop samen met alle mogelijkheden die u van een PicoScope oscilloscoop zou verwachten. Up to 500 MHz bandwidth. Up to 2 GS memory. Over two decades of PC–based design experience and listening to your needs and desires has resulted in the PicoScope 6000 series — the ultimate in USB oscilloscope design. With the choice of either a 250 MHz, 350 MHz or 500 MHz analog bandwidth complemented by a real–time sampling rate of 5 GS/s, your PicoScope 6000 series scope can display single–shot pulses with 200 ps time resolution. ETS mode boosts the maximum sampling rate to 50GS/s, allowing a more detailed display of repetitive pulses. 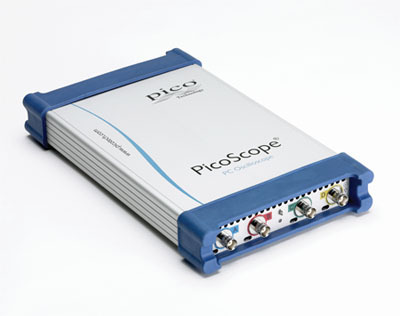 The PicoScope 6000 Series gives you the deepest buffer memory available as standard on any oscilloscope at any price. The SuperSpeed USB 3.0 interface and hardware acceleration ensures that the display is smooth and responsive even with long captures. Other oscilloscopes have high maximum sampling rates, but without deep memory they cannot sustain these rates on long timebases. The 2-gigasample buffer on the PicoScope 6404D can hold two 200 ms captures at the maximum sampling rate of 5GS/s. To help manage all this data, PicoScope can zoom up to 100 million times using a choice of two zoom methods. There are zoom buttons as well as an overview window that lets you zoom and reposition the display by simply dragging with the mouse. As well as the standard range of triggers found on most oscilloscopes, your PicoScope 6000 series scope has a built–in set of advanced triggers to help you capture the data you need. The custom probes feature allows you to correct for gain, attenuation, offsets and nonlinearities in special probes, or to convert to different units of measurement. You can save definitions to disk for later use. Definitions for standard Pico–supplied probes are included. The PicoScope 6000 series has high–speed circuitry that can trigger on and capture over one million waveforms a second, increasing your chances of spotting an infrequent glitch. The drivers and software development kit (SDK) supplied allow you to write your own software or interface to popular third–party software packages. If the 1 gigasample record length isn’t enough, the drivers support data streaming, a mode that captures gap–free continuous data through the USB port directly to the PC’s RAM or hard disk at a maximum rate of <10 MS/s (PC–dependent). With 4 channels, up to 500 MHz bandwidth, 5 GS/s real–time sampling and up to 2 GS memory, the PicoScope 6000 series are the ultimate USB 3.0 oscilloscopes. A quantum leap in PC–based test equipment, the PicoScope 6000 series give you world–beating performance together with all the features you would expect from a PicoScope oscilloscope. And — unlike other manufacturers — all features are included as standard (when new features are added you simply need to download a free copy of the software). If you want the ultimate performance and the ultimate value for money, you want a PicoScope 6000 series oscilloscope. 100 MS in PicoScope software. Up to available PC memory when using SDK. Spectrum mode: frequency at peak, amplitude at peak, average amplitude at peak, total power, total harmonic distortion (THD % and THD dB), total harmonic distortion plus noise (THD+N), spurious-free dynamic range (SFDR), signal+noise+distortion to signal+noise ratio (SINAD), signal to noise ratio (SNR) and intermodulation distortion (IMD).